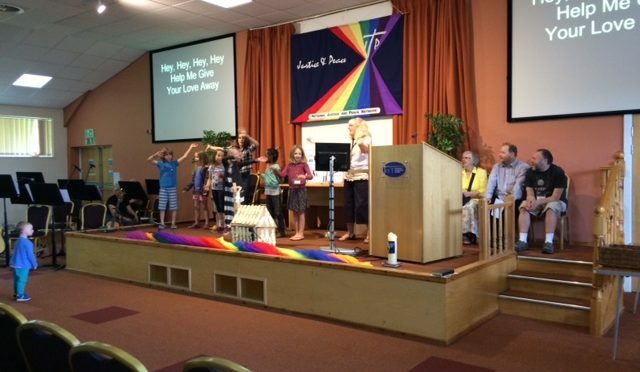 A number of children and young people from around the dioceses came with their families to the NJPN Conference 20-22 July. The beautiful surroundings of the Hayes Conference Centre in Derbyshire, together with the glorious weather made an ideal setting to celebrate the beautiful and perfect world created by God and to consider what kind of things are going wrong in the world. Gospel Stories were shared, The Good Samaritan leading to question: How can we help others? The Escape into Egypt, leading to consider what it must be like to be a refugee, followed by the constructing of cardboard dens, thinking about what it would be like to sleep in something like this every night, leading to discussion on how it would feel to be cold, wet and lonely, with no electronic devices to make communication easy. The children then engaged in spontaneous role play, which, amusingly, caused some consternation among groups of adults who were sent scurrying around looking for appropriate help, when they were asked: can you help me, I have nowhere to stay? The exercise raised an amount of money for a local shelter- very effective. The final sessions explored the fact that things are not always straight forward sometimes for many people, they are slippery and difficult just like slime. The children listened to the story of ‘Salt and Light’ then thought about any difference that they could make and brought their ideas and prayers for inclusion in the final liturgy, a joyous celebration to send us all home with renewed vigour and commitment to work for a more inclusive and safe world for all God’s people. NJPN would like to say a huge thank you to all the children and young people as well as the adults who came with them, for the wonderful contribution to a special weekend gathering. Many thanks go to https://www.valleycids.co.uk/ for facilitating the children and young people’s groups and providing such a wonderful experience for all of us.